Research recently undertaken by the technical wizards at Webasto, Germany has at last helped resolve a long-standing annoyance…. Fuel dosing pump ‘ticking’ noises while we’re all trying to get some sleep at night. This ticking is a structure-born noise which is partly transferred via the plastic fuel line into the boat hull or vehicle chassis. 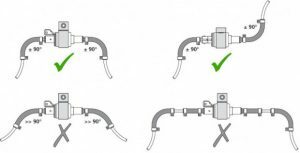 Installation of 2 x 90° elbows at both sides of the fuel pump result in a noise reduction of up to 10 dB. The resulting noise reduction is very noticeable inside the vehicle or boat. Please ensure to order your 2 x 90° elbows from ButlerTechnik prior to your next night’s heating! connector hoses but they would have different internal and external diameters.